Black is the new black, beautiful the new ugly, ugly the new . . . et cetera, et cetera. Brutalism as an architectural movement is an interesting one – what was etymologically derived from French “béton brut”, meaning roughcast concrete, is an eye sore for some, inspiration for others. What initially emerged as a necessity to build accommodations for booming populations in the post-war era, the unadorned architectural style is often being dismissed as unimaginary, monolithic and a product of conservative thinking. 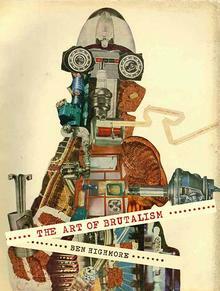 Whatever your standpoint may be, The Art of Brutalism: Rescuing Hope from Catastrophe in 1950s Britain zeros in on the brutalist movement and the effects has not only had during its inception but explores how it infiltrated the realm of art and created a sensibility that reverberates to the current day and age. Opulently illustrated, the sujet is meticulously researched and sheds light on the circumstances that spawned brutalism as well as the influence it exerts via depicting sculptures, collages and the aftermath of World War II. Substantiated by documentary evidence, sketches and pop culture tidbits, the tome offers an engaging visually rewarding experience that rests on a solid foundation of art history, which helps to thoroughly understand artistic milieus and what informed them. What is particularly interesting is when artists from seemingly unrelated disciplines describe how their approach has been informed by a brutalist approach, e.g. photography or sculpting. The book left me intrigued and triggered research into current local brutalist landmarks in a bid to experience first-hand how a style that lacked a movement or distinct style came to be. After exposing themselves to this book, haters might find themselves questioning if brutalism is merely a noun for failed architectural endeavours, as it makes the merits of its legacy transparent especially when it comes to finding hope in wreckage.